There’s a division of opinion on which Mac is best way to go for high level, fast processing in the graphics and video editing industries. Our infographic outlines the clear differences between the two. The iMac wins hands down on cost. It’s cheaper and includes the 5K Retina 27” Display. However there’s always a compromise, and this comes in the form of performance. The more expensive Quad Core Mac Pro has a faster CPU and graphics card, using the much faster Flash Storage. Nevertheless, you still have to add a screen to the Mac Pro. Some customers view this as a bonus as they can select the screen that’s right for them. 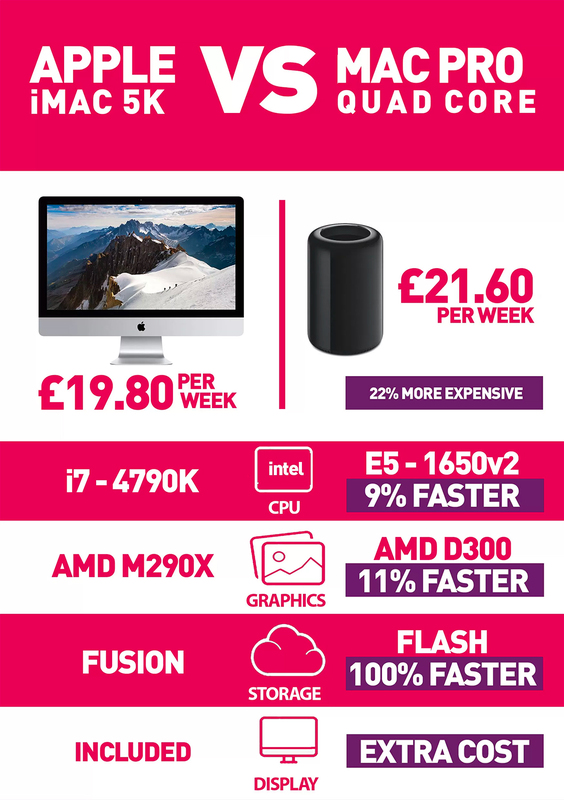 With the ability to future proof the Mac Pro may get your vote, but for the cost the iMac with 5K Retina is superb value and will knock spots of your old Mac.